The HD 205 provide an excellent sound quality and a brilliant shielding of ambient noise. 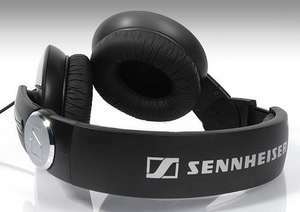 The rotatable ear cup as well as the single-sided cable make them a professional companion even for DJ's. The HD 205 come with a convenient protective pouch for storage and transportation. I have a set of these and the 201's. the 205 make you feel like your head is in a vice - so not comfortable for more than 30 mins for me - so not good for watching a movie.. Note I don't have a big head. I wear these for playing my Roland drum kit and the sound is superb - were recommended to me by my bass playing mate who knows his onions. They do get a bit tight after an hour of playing, think I paid £35 so hot enough deal. (Added). voted cold, seen these way cheaper before. I personally have the HD 202 and they are decent sound quality. Ive had them for a good couple years or so now and do an amazing job. As for comfort, all headphones will get uncomfortable after wearing them for a while. Yep, def give your scone a squeeze. But give good isolation in that way too. long cable so prob not great for MP3 players etc. But, great for trombonists in recording studios as they can rotate one cup outta the way of the pipe that runs just past the left ear & out to the bell end. The tightness bears why the they have good sound and external sound shielding,trade off? Note I don't have a big head. I tested loads of different headphones before buying these. Brilliant sound, comparable to sets costing much more. I'd buy them again any day, especially at this price. Heat added.